- KCO-FDB-32S is the FDB fiber optic splitter terminal box, special design for outdoor application with Anti-UV and water-proof function. 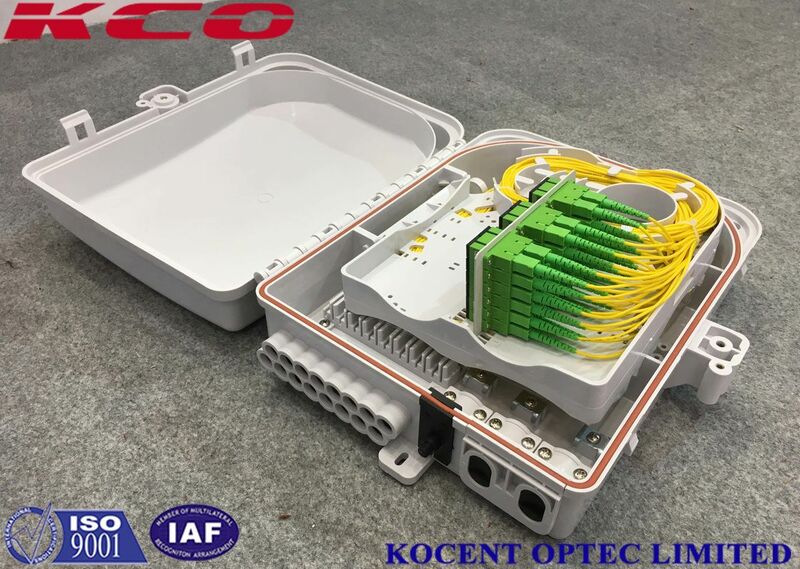 - It is widely used in FTTH access network, Telecommunication network, CATV network, Data communication network and Local Area Network (LAN). + Industry standard user interface. + Made of high impact plastic. + Can accinnidate 1*2, 2*2, 1*4, 2*4, 1*8, 2*8, 1*12, 1*16, 2*16, 1*32 fiber optic splitter. 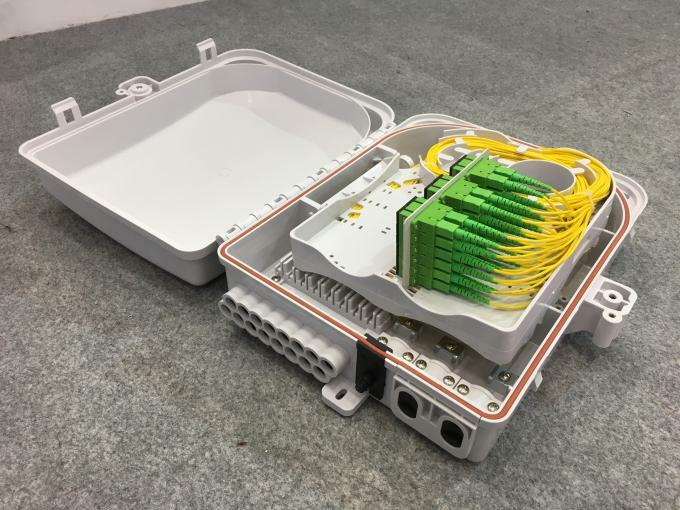 + Up to 24 FTTH drop cable ports. + Wall mountable and pole mountable. + 2 inlet ports and 24 outlet ports. - Wall mounted for indoor or out door, white color, graceful style and good adaptability to environment. - Made of high quality ABS+PC, anti-collision, flame retardant, resistance to impact. - Anti-UV, wet-proof, water-proof, dust-proof, anti-aging. - Fit for 1x4, 1x8, 1x16 and 1x32 PLC splitter assembly. - It has 2 input ports and 16 output ports on the bottom and it is easy to install on the wall or pole. 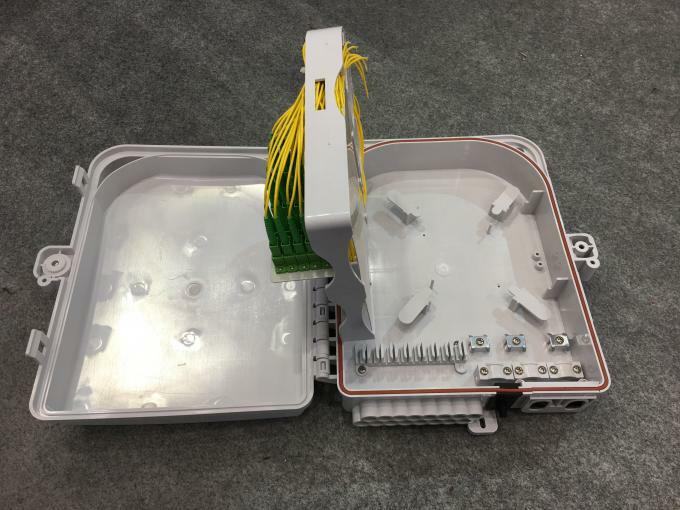 - The rear tray is for splicing a fiber of feeder cable with PLC splitter and the front tray is for connecting subscriber's drop cable through adaptor plate on the tray. - Cable, pigtails, patch cords are running through own path without disturbing each other, easy maintenance. - Distribution panel can be flipped up, feeder cable can be placed in a cup-joint way, easy for maintenance and installation. 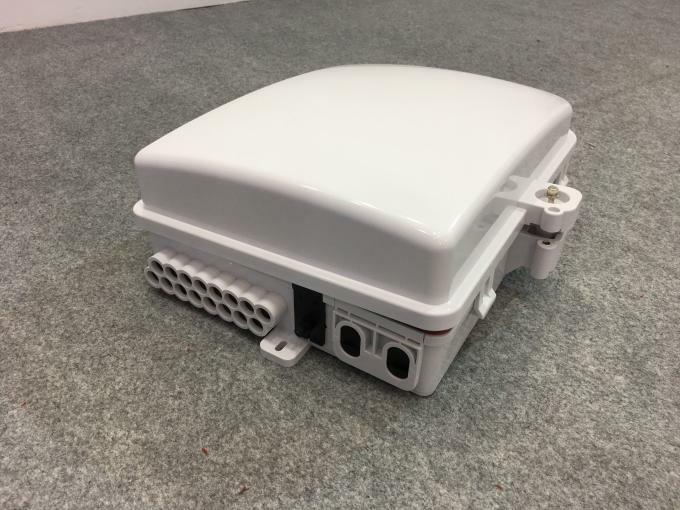 Otherwise of this model of FDB splitter box, we also can supply the FDB box with capacity 2 ports, 4 ports, 6 ports, 8 ports, 12 ports, 32 ports, ... that can install 1:2 splitter, 1:4 splitter, 1:6 splitter, 1:8 splitter, 1:16 splitter, 1:32 splitter and also 1:64 splitter. Please contact with our sales team to get more information about thesr products.